Composite tiles appeared on the Ukrainian market in 1997. 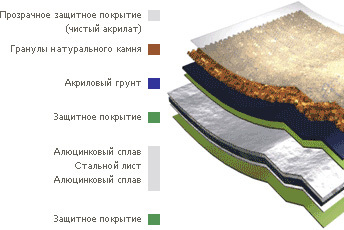 This is a reliable roofing, foundation of which is a high-quality steel sheet, coated on both sides alyutsinkovym alloy, composed of certain proportions include aluminum, zinc and silicon, have excellent anticorrosive properties. On the external side of the composite tile coating of granules of natural stone, through which the life of the material is more 80ti years. This roof is in appearance very similar to the natural tile. Tile has 6t different types of profiles, allowing the roof to give your home personality. Your roof can get bumpy wood (lath), volumetric and research form a natural tile and severity forms of shingles. Composite tiles - laminated roofing material consisting of steel sheet 0,5 mm thick coated on both sides of the alloy of aluminum, zinc and silicon - aluzinc. Outside, it is covered with basalt granules, which caused a layer of acrylic primer. The composite tile is lightweight, rich appearance, an unlimited number of colors and shapes. Unique profiles piece of metal tiles completely mimic ceramic tiles, making them ideal for reconstruction of buildings and monuments, as well as to give new buildings a unique appearance. Unlike traditional metal, composite tile is small in size sheets, virtually eliminating unnecessary waste and simplifies the installation of tile. 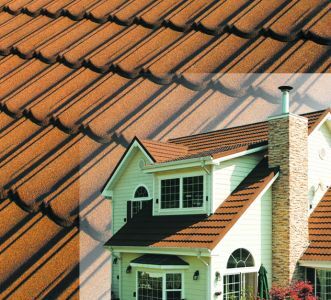 By coating of stone granules, roofing shingles of the composite is almost not subject to corrosion and can withstand sudden temperature changes. Composite tiles resistant to UV light and keeps the color for the entire lifetime (several tens of years). In addition, the composite metal is not afraid of fire, ie relates to fire-resistant roofing. This type of roof to treat premium sigmentu and underlines the status of its owner.